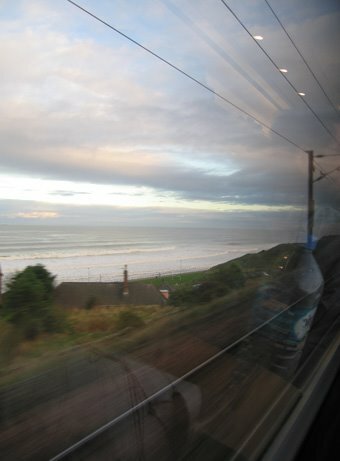 Canada wasn’t a holiday, and it was clear that from November there’d be no time to be away until late next spring so we had to act quickly: train to Edinburgh (seemed as good a place as any) for a long weekend. I like travelling by train. I enjoy the forced relaxation: once you’ve boarded, all other major decisions are out of your hands. I treasure the hours during which I have only to choose when to eat lunch, whether to knit or to read, which item of knitting deserves attention. And all the while the world is rolling past my window, a new vista every few minutes. Or at least that’s how it’s supposed to work. We had an unexpected adventure forced upon us, when some poor person, a ‘fatality at Huntingdon’ stopped the East Coast Mainline service in its, er, tracks. While the train company frantically searched for buses to transfer passengers at stations to Peterborough (which is where southbound trains were halted), we did something I’ve only read of in books: with ringing voice I asked if anyone cared to share a taxi north to Peterborough Station. It worked! Forty minutes later the taxi disgorged us and we bagged even better seats on a train to Edinburgh. Above is the view just south of Berwick-on-Tweed, the North Sea eating away the coast. While I took this photo the young lad next to me was trying his hand at my knitting, much to the amusement of his GF. I will remember him when I wear that shawl. Shopping? The main streets are lined by the same shops you’d find in any other large British city. Just colour the tourist tat tartan and scent it with whisky. By sheer coincidence (honest) Drummond Wools was virtually just across the street from our guesthouse. I think the vast array of computerised sewing machines may have replaced most of the coned yarn, and their knitting yarn selection was, well, painful. It felt 20 years behind the times. This is what I was directed to when I asked for ‘wool’. 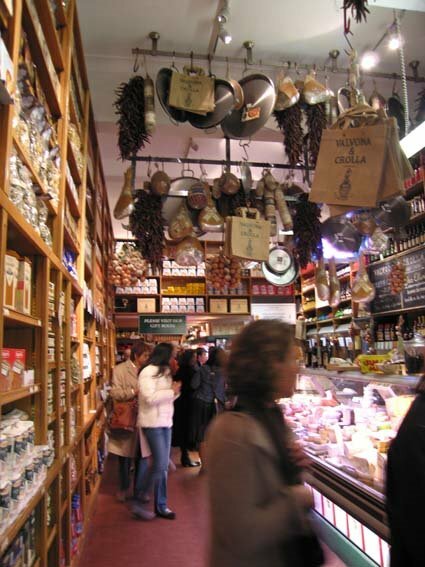 But Man Does Not Live By Wool Alone… Valvona & Crolla is famous for food! Behind the refrigerated displays the shelves of liqueurs stretch from floor to ceiling. Ask for a bottle high on the shelf and the chap reaches for a telescopic pole with a rubber-coated clamp at the top. Tension mounts as he maneuvers the clamp around the bottleneck, pulls it tight, then manages somehow to bring the pole down while holding the clamp shut. *Huge* sigh of relief. I asked if they broke many bottles and he said ‘Yes, but the noses hurt more.’ I hadn’t considered that a bottle slipping from the clamp would plummet straight down into the face of the person holding the pole. The shop continues back, past the chocolate, the olive oils, vinegars, fresh-baked breads, wine (oh, the wine!) and then: a restaurant. Their delicious pizza fueled further explorations. We do almost all of this on foot, you know: a bit of string on the map suggests we averaged 5-8 miles/full day, which justifies quite a lot of eating. Just as well, really. We walked to dinner but took a taxi home from Daniel’s in Leith — that’s the first time either of us has ever hailed a cab. The second was the next night, when we didn’t want to walk the mile ‘home’ when the Ghosthunter Trail finished at Canongate Churchyard in the rain. The ‘Trail’ wasn’t quite what I’d expected either: the guide was good, but spent a little too long telling us how much better the other tours were. And the frequent references to Most Haunted (what is that, anyway… ah. I see) were completely lost on us. 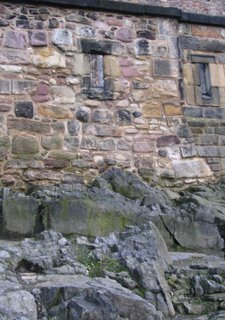 We ‘did’ the Castle and the Honours of Scotland aka the regalia. Reading the history of the regalia I found it really difficult to believe they misplaced the latter for over a century, just put them in a chest after the Act of Union 1707, locked the chest and the room it was in, then forgot about them. Later a stray thought pointed out that this was how many of us, well, at least in my family, deal with painful things: lock it away in the back of our minds. The pain goes away if you don’t dwell on it. The Castle is essential. I suppose everyone wants something different from it; the Merlin-equivalent clad in purple and silver cloak and fake hair capering about in the central courtyard did nothing for me. I liked the way the stone walls seem to grow out of the native rock of the volcanic plug on which the castle stands. 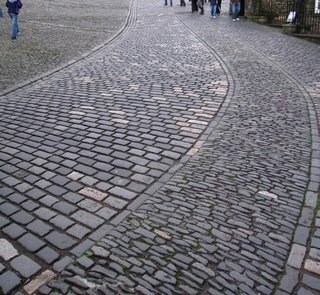 I liked the pattern of the granite setts in the roads that flowed downhill. I was stunned by the beauty of the embroidered altar cloth in St Margaret’s Chapel at the top of the Castle. Alas, the flash washed out the colours, and my hand-held photo is terribly fuzzy. Go and see it yourself if you can: it’s utterly fabulous. More wonderful embroidery hangs on the walls of the rooms housing the Honours, but visitors were just walking past these works of art as though they didn’t exist, these hours of patience and skill made corporeal in silk. Why were there no postcards of these things? We saw the new Scottish Parliament (here’s the official site and here’s a more general view with links to some of the controversies). Taken as a whole, this is the Ugliest Building I Have Ever Seen. ‘Too many cooks [in this case, ideas] spoil the broth’ made flesh. The materials of which it is made (stone cladding, sheet metal) strive to pull the disparate bits/styles together and fail miserably. It’s HORRIBLE. The ‘undercroft’ entrance hall is a good example of a good idea that should never have been built: it might have worked in Spain or southern France, somewhere with enough sunlight to light the space under the concrete through all the year. Even with all the lights on, in autumnal Edinburgh it was almost too dark to read the information displays even in mid-afternoon. We shouldn’t have bothered: they were some of the most poorly designed displays we’ve ever had the misfortune to struggle through. So don’t bother: go around the corner and spend an interesting and informative hour or two in Our Dynamic Earth, Edinburgh’s Millennium Project. We both enjoyed it tremendously, and I’ve got lots of photos to inspire me. What else was really good? 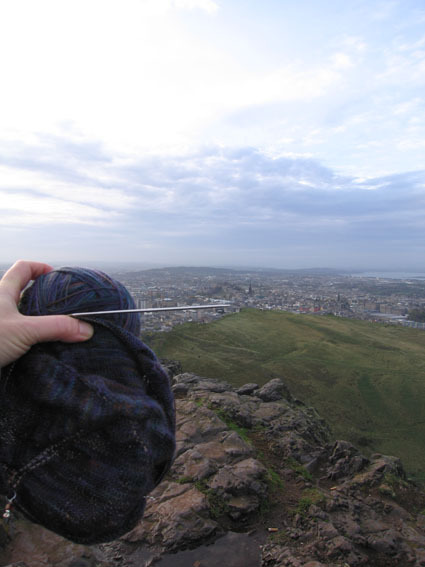 Arthur’s Seat,* of course. I did some token knitting as we and about 50-75 other people enjoyed the grand vistas across Edinburgh (if I’d thought harder, I’d have positioned the needle to point AT the castle, instead of running just below it. Sorry about that). Notice the gleaming rocks polished by the passage of thousands of feet. Anyway. It was a good long weekend, just the right length. It’s good to be home, too: there’s no place like the right bed, with all the right hollows in all the right places. It’s a shame about the 1500 email messages, of which about 20 were urgent/work, though. Enough procrastination, I will Deal With Them immediately! * We did it from the west, fools that we are. Straight up the hillside, feeling sorry for and grateful to the volunteers who spend their time building the stairs up and down which we tourists toil. Even sorrier for the lad 8? 10? whose father was verbally driving him up the hillside as we came down; with eyes fixed and unseeing the child was keening, a continuous faint, high, terrified wail of fear though surrounded by parents, siblings and grandparents. Even as I tried to work out what was wrong, what to do, how to say something, it was too late, the queue of which they were part was well above us and there was neither space nor strength in my legs to catch up. I think the less of me for that. This entry was posted in Uncategorized on October 31, 2006 by sarahw. thank you for taking me to Edinburgh! I too went away for the weekend. I went to Sarasota, Florida to see in-laws and help do research. Lots of strip malls, expensive shops and –the best part–lots of warm nice sunshine and a very pretty beach. I helped the biologist catch moths for his research, and I ate and knit a lot.Finally, after two nights at home, I am caught up on my rest. This going away is sometimes wonderful, and sometimes exhausting. The gourmet shop you went to sounds fabulous, though, wish I could have gone there! As usual, your words paint a very colourful picture. I enjoyed reading about your experience of the city.The little boy you feel bad about….don’t be hard on yourself. It’s very difficult to intervene on any scale, when it comes to a family situation (unless there’s physical abuse happening right in front of you, of course). Valvona & Crolla was marvellous. Not quite as exotic as I’d hoped, but at least I could work out what all the things were. I’ve been in shops full of what is obviously Really Cool Food, but been completely unable to work out what most of it was!There were several people travelling with children that (to my untutored eye) seemed under 12. Most of the parents didn’t seem relaxed at all Alice, thanks for that. It seemed that most of the child’s family was there, so they should have had the situation under control; I just can’t help feeling that, I dunno, talking to him or something would have helped. Might be easier when I get older and greyer (more respectable??). Provided I can still climb hills, of course! Your photos are so beautiful…everything is still green and the vistas are amazing. 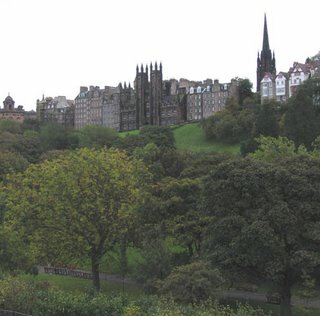 I’m glad that you had a good time (all things considered) — my husband and I love train trips and we hope to take one from England to Scotland one day. It is marvelous to watch the world go by outside your window like that. Very peaceful.